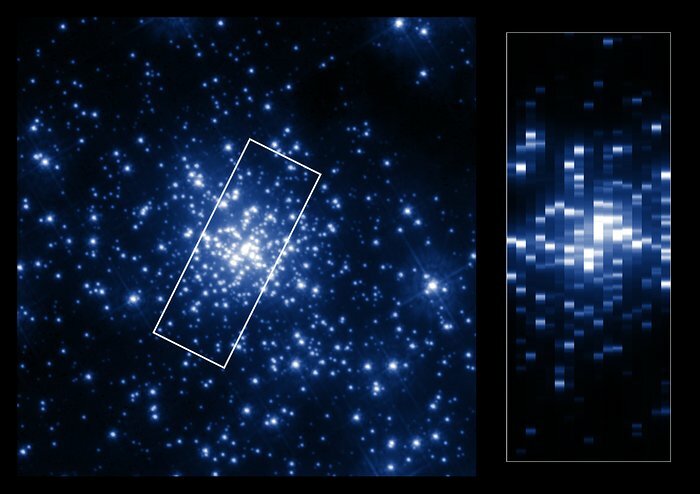 The left side of this collage shows the central part of the young star cluster R136 as it can be seen in the ultraviolet. Due to the high-resolution of Hubble in the ultraviolet the individual stars in this dense cluster can be resolved and studied. The right side shows a pseudo-image, created from the UV spectra collected with the Space Telescope Imaging Spectrograph (STIS). These spectra have been used by scientists to determine the properties of the stars in R136. The boundary of the 17 slit locations is outlined in white in the left image. The long-slit data from the spectrograph have been compressed to the width of the slits and stacked to create a pseudo-image. This allows the slit locations to be matched to stars in the left image.